Many of you probably get up every day with the help of an alarm on your smartphone. But are you using your phone’s alarm to its full potential, or settling for the standard default ringtone at a certain time and leaving it at that? These are the tricks, the apps, and the gadgets that can upgrade your wake-up experience. The Clock app that comes with Android recently added support for Google Assistant routines, so you can turn on your smart lights or get a morning briefing at the same time that your alarm goes off. When you’ve set an alarm under the Alarm tab, tap Google Assistant Routine in the panel underneath. You can get a report on the weather, the news, or your schedule. 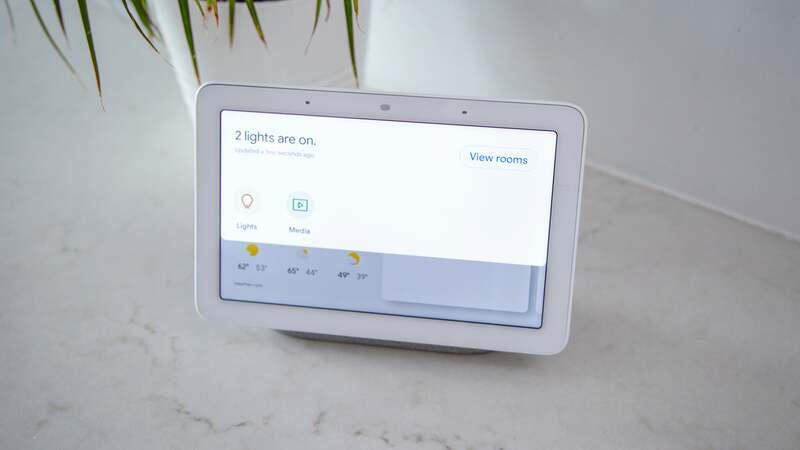 You can also take your phone out of silent mode or do something with any smart lights, plugs, or thermostats you’ve hooked up to Google Assistant. On top of that you can play the news, a podcast, or an audiobook by selecting an option under the And then play heading (tap the cog icons on the right to configure these features further). If you want to wake up to music, tap the alarm sound on the main Alarm screen. 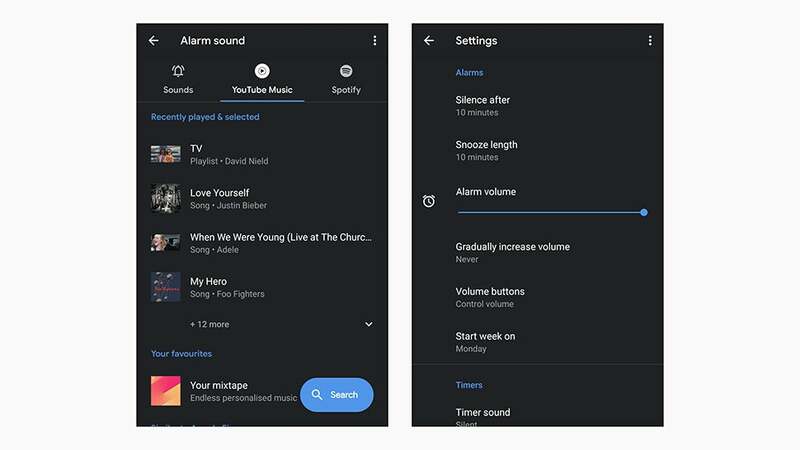 The options to wake up to YouTube Music (if you’re a premium subscriber) or Spotify (whether you’re a premium subscriber or not) were recently added to the Clock app, so you should see them alongside the usual selection of ringtones. If you want to wake up to a specific song or audio clip without the aid of Spotify or YouTube Music, you need to create your own custom alarm sound. To take more control over your alarms on Android, tap the menu button (three dots, top left) on the Alarm screen then choose Settings. 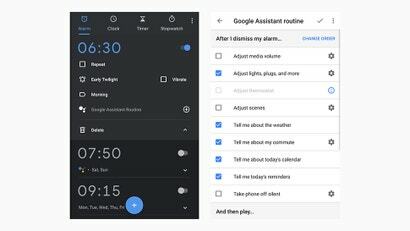 The subsequent list of options lets you set how long alarms ring as well as their volume, how long the default snooze period is, and the function of the volume buttons on your phone. (They can be used to dismiss or snooze alarms, or change alarm volume). Tap Gradually increase volume to do just that: If you don’t want to wake the rest of your household with an alarm but do want to make sure you get out of bed, set the initial alarm volume to a low level, then set the volume to ramp up over a period of between 5 and 60 seconds. 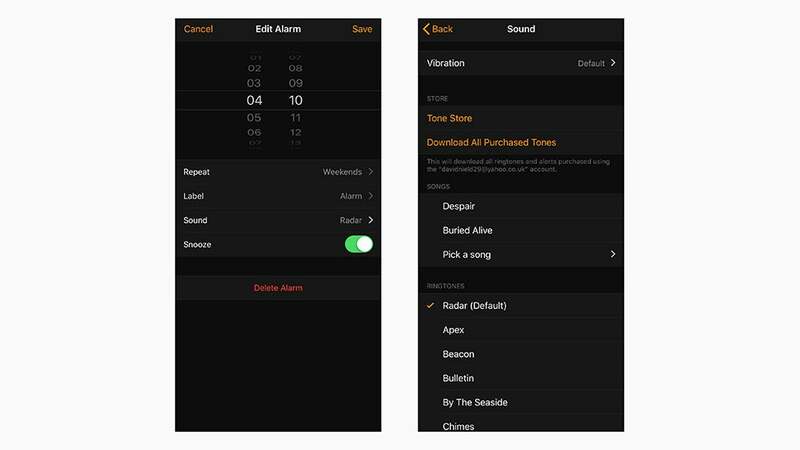 Adding alarms on the Alarm tab of the Clock app for iOS is straightforward enough, but there are a few tricks and features you might have missed. Firstly, you can toggle the Snooze option off for when you really need to get out of bed immediately. There’s also the option to name each of your alarms via the Label field. The only purpose this serves is to help you distinguish between alarms — e.g., weekend wake-up calls and reminders to take medication—but the option is there if you need it. Tap on the Sound button and you get a host of options, including the ringtones that come with iOS, ringtones you can buy from iTunes, and songs you’ve got synced to your phone from iTunes or available from Apple Music (tap Pick a song to make your pick). Follow this guide if you want to make some custom ringtones. If you want a more subtle wake-up call in the morning, you can turn on vibration as well as or instead of an audible alarm. If that’s your preferred method of waking up, you can choose from the list of options iOS gives you, or even create a custom vibration by tapping on the screen (select Create New Vibration to do this). To control the volume of alarms on iOS, tap Sounds & Haptics from the Settings app in iOS. Drag the Ringer and alerts slider to change the default alarm volume, and turn the Change with Buttons toggle switch on if you want to be able to adjust it as it’s ringing with the volume buttons. It takes you through the process of setting a morning alarm, but will also remind you when it’s time for bed based on how much sleep you want to get as well as track how well you’re sticking to your goals over time. You’ve got a wealth of options to pick from when it comes to third-party alarm apps, and it seems like more are being added all the time. 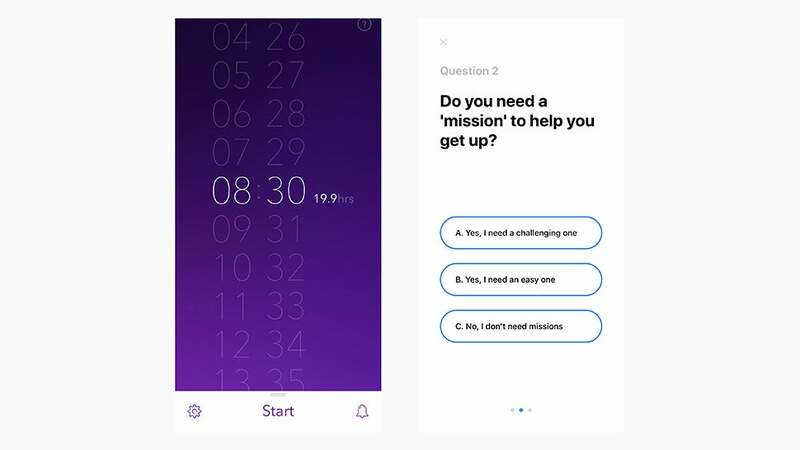 If you’re struggling to get out of bed, these apps can force you to, for example, complete a maths challenge or some other task to silence the ringing. Several of these apps will attempt to wake you up at a time that fits in with your body’s natural circadian rhythms. In theory, that makes for an easier time actually getting out of bed. 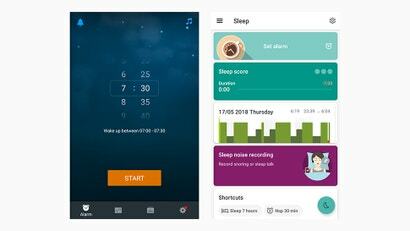 Sleep Cycle for Android and iOS, is one of the best in the business, and it’s free to get started. 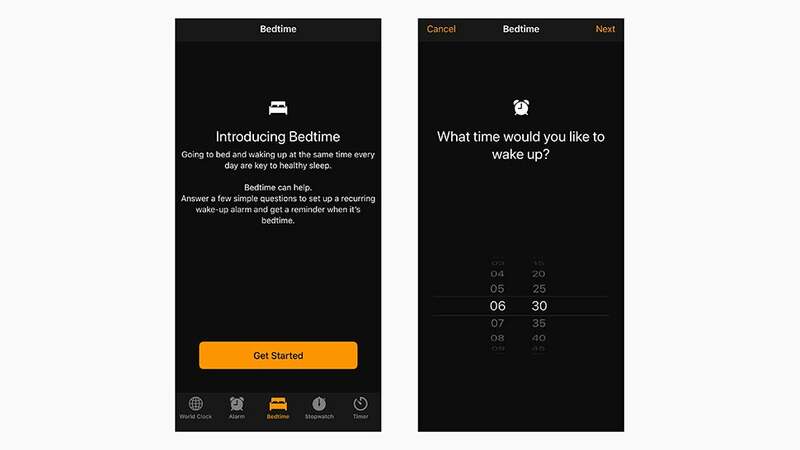 With this one, you can customise your wake-up window, analyse your sleeping patterns over time (based on the sounds you make during your slumber), and get nudged into wakefulness during a light period of sleep. Sleep As Android for Android is another excellent app that combines sleep tracking with smart alarms, but as the name suggests, it isn’t available for iOS. It sits on your mattress to judge how well you’re sleeping and can wake you at a time that fits your periods of light sleep. It also comes with a selection of natural sounds to use as an alarm. The app is free to use, but extra features can be unlocked with a one-off $6 payment. For iPhone users, the freemium Pillow for iOS is similar to Sleep As Android. 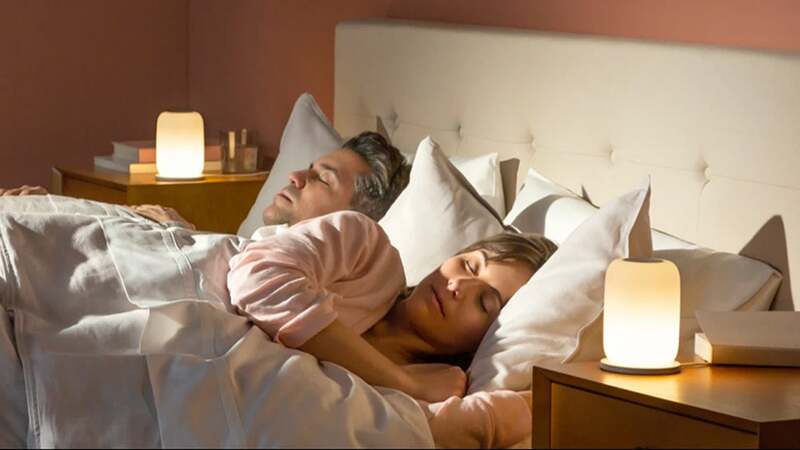 Either place your phone near your pillow (see the link?) 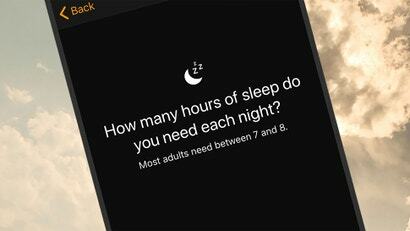 or connect it to an Apple Watch, and the app measures the quality of your sleep and picks the optimal time to wake you up (within a specific time window you’ve already configured). It also comes with a choice of ambient and natural sounds to wake you up more gradually. 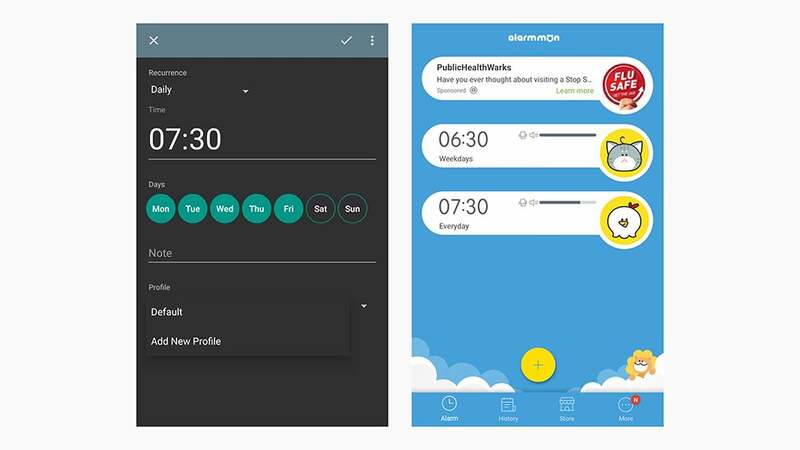 The freemium Alarmy for Android and iOS has been helping people get out of bed for years and remains one of our favourites. It comes with a whole host of challenges for silencing your alarm, from taking a photo of something like your bathroom faucet to solving a maths problem. The idea is that by the time you’ve managed to switch the alarm off, you’re well and truly awake. You can also get weather and news updates through Alarmy as well. Also worth a mention here is AlarmMon for Android and iOS. The freemium app stands out for the way it makes waking up fun (or at least tries to): There’s a choice of mini-games to help rouse you from your slumber more efficiently, a selection of weird-but-cute sounds to wake you with different audio each day, and even ways to log your patterns of waking up over time. Carrot Alarm for iOS will set you back $4, but for your money you get a talking alarm clock that’s a little different from the norm. In addition to having a lot of attitude, the app comes with a choice of options for shutting off the alarm, including shakes, swipes, and pinches. The alarms themselves can be a mixture of custom dialog and music, and the app actually gets angry with you if you hit the snooze button too many times. 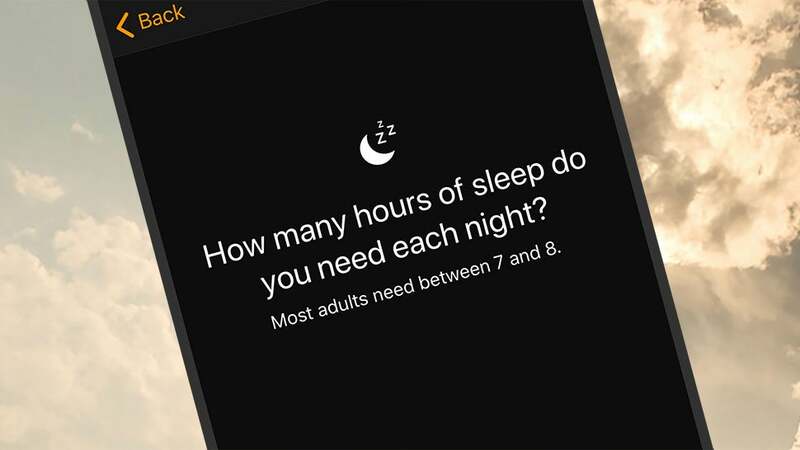 Last but not least, Alarm Clock For Heavy Sleepers for Android is a freemium alarm clock app that’s well summed up by its name. In its attempts to drag you out of bed, the app can combine multiple alarms and challenge you with maths puzzles. It has some other neat tricks too, like the ability to disable alarms on public holidays or to set alarms based on your location (so you don’t get woken up too early on vacation). Another way to upgrade your morning wake-up experience is to get something else working alongside your phone to get you out of bed. A dock like the iHome Bluetooth Alarm Clock will wirelessly charge up your iPhone overnight, tell you the time, and add some extra volume to those alarm sounds. 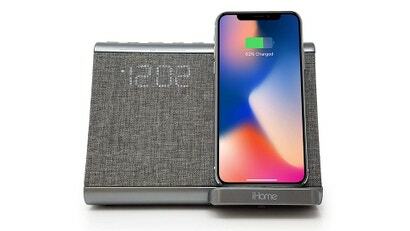 There aren’t too many brilliant alarm clock dock options for smartphones these days, but another one we like is the Dpnao Charging Docks Station: It works with all recent iPhone models, and it too will charge up your phone while you sleep in addition to making sure the alarms are loud enough to get you out of bed. And the advantage of having a dock that’s not right by your bedside is that you do actually have to get up to turn the alarm off. Whether or not you want to invest in a separate dock device, if you’re struggling to wake up in the mornings, try putting your phone on the other side of the room (or even in another room entirely). 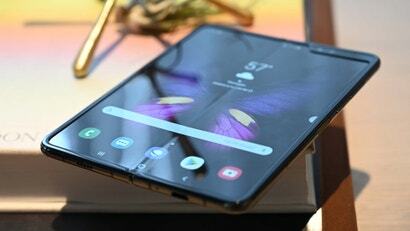 With so many shapes and sizes to cater for, there aren’t as many docks for Android devices as there are for iPhones. One we have spotted is the Philips AJT3300 device that brings with it several useful features. 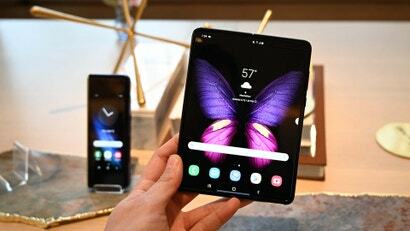 Some of those include keeping the time on display, playing music (or alarm sounds) over Bluetooth, and charging your phone. Don’t forget you can get a variety of smart lights as well now to work in tandem with your phone (you could control them with Google Assistant when an alarm goes off, as we mentioned at the start). The Casper Glow, for example, can gently dim at bedtime and gently brighten in the mornings to ease you into the day more naturally.